Let's just say, hypothetically, that we received a basket full of goodies at the office because it was our hundredth anniversary there (or something like that). And let's just say, again hypothetically, that the basket included such yumminess as fresh fruits and bagels and various flavors of tea. Also included in the basket was a jar of Biscoff European Cookie Spread. Let me just tell you, if you have never had a Biscoff cookie, you're missing out (assuming of course that you like cookies, and your like for cookies includes the likes of ginger snaps, snickerdoodles and cinnamon crisps). I cannot describe the taste and texture of a Biscoff cookie perfectly because my palette is simply not trained for that kind of labor intensive work. But imagine if you will a shortbread type cookie, one that is crispy and crunchy when you bite into it, but then it sorta, crumbles and melts in your mouth as it sits on your tongue. The taste is a medley of cinnamon, ginger, spicy, warm goodness. There is almost a buttery caramel thing going on. Like I said, I cannot describe it. I can only attest to its deliciousness. 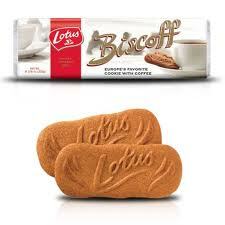 I first had Biscoff cookies on a flight from Arizona to Utah. Then I found them at my local Fry's store (Kroger/Smiths). So imagine if you will, the anticipation going on in my mouth when I saw that jar of Biscoff cookie spread. And the very first thought was I have got to take this home! So after everyone left (and by everyone I mean my receptionist), I straightened out the break room, put away the other food stuffs, cleaned the coffee pot and promptly put that jar in my purse. And last night I introduced it to the dramas. What happened next is one of those what happens during the throws of edible ecstacy stays in the kitchen things. Suffice it to say, Biscoff spread is better in our collective opinions than apple-butter, peanut butter and I believe that it just trumped Nutella in my house. We had it on toast; on apples; on celery, on a nilla wafer and one of the dramas ate it right off a spoon. *this is not a paid post. 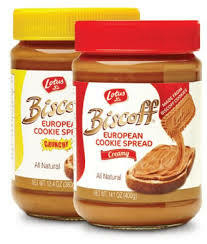 I just really do love Biscoff cookies and now, the cookie spread.